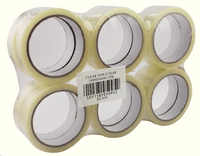 Adhesive tape for sealing, securing and packaging. Made from clear polypropylene plastic. Easy-tear formulation: rip as much tape as you need. Strong self-adhesive backing for paper and card. 24mm tape supplied on 66m rolls. Approx Dimensions (CM): D11.5 W11.5 H31. Approx Weight (KG):0.8151.